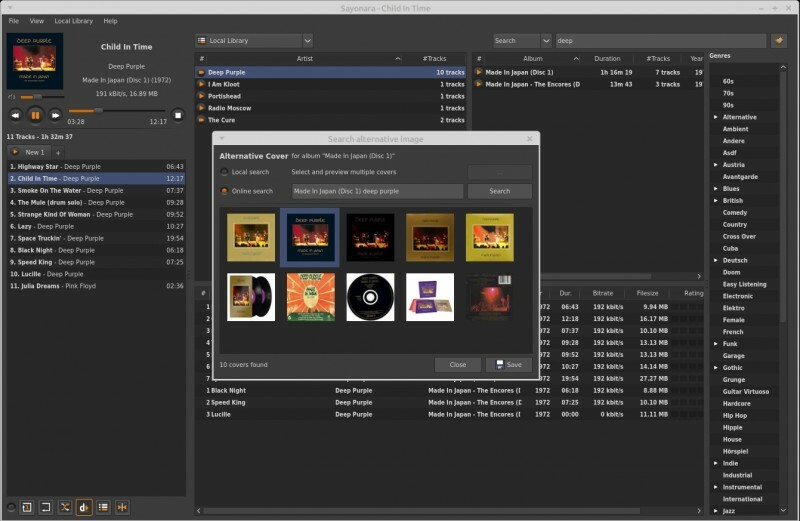 Brief: We’ll see some of the best music players for Linux you might not even have heard of. 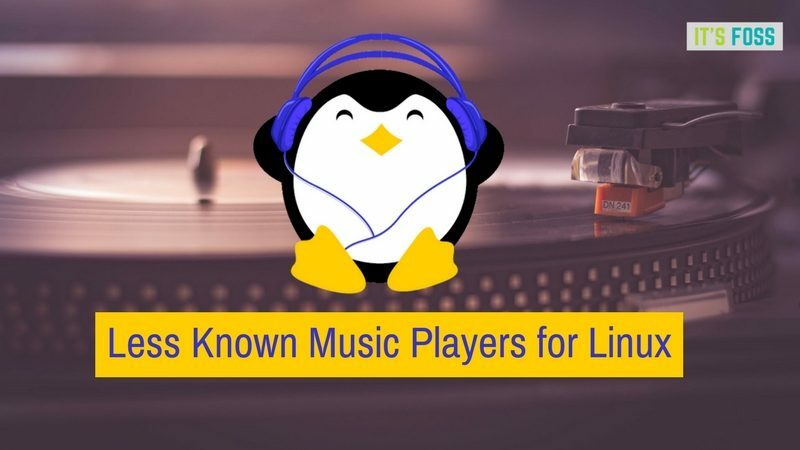 Music players like — Rhythmbox, Amarok, Clementine etc are quite well-known and used by a significant part of Linux users. These are one of those essential applications for Linux that you must have. But as I always say, there are always alternatives in the Linux world. 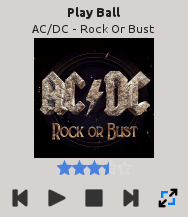 And I can probably tell you about a few nice music players for Linux you might not have heard of before today. Of course, they might not suit your needs or maybe you won’t like them. But regardless, it doesn’t hurt to know a few alternatives, does it? Okay, let’s start. Just to clarify, they are not listed in any particular way. You yourself will have to try them and find out what suits you. Lollypop is one of my favorite music player on Linux. Lollypop is modern and minimal with its slick design. It was designed to play well with GNOME desktop environment and has both light and dark theme variant. Lollypop is lightweight and fun to use. Your music library can be sorted by Album, Artist or Genre names. Browsing and searching through the music collection is quite intuitive. Lollypop can fetch lyrics and artist bio from the web. It also fetches cover artworks automatically. It can stream songs from online music services and charts, like – Spotify, Last.fm, iTunes etc. You can also add online radios stations on Lollypop. It supports scrobbling songs to Last.fm & Libre.fm too. There is a visually appealing full-screen mode interface available. You can turn on Party mode and sit back and enjoy songs chosen by Lollypop. You can also sync songs with Android or other MTP devices. If you are heavily into streaming online music, you might want to check out Tomahawk. 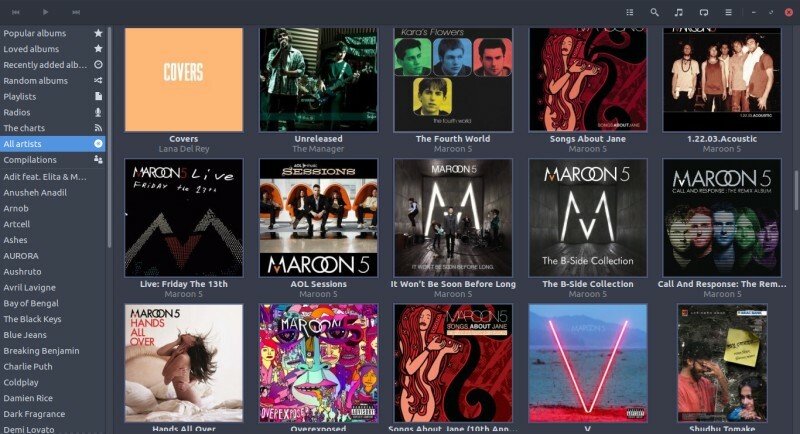 Tomahawk is a cross-platform music player that can stream music from a bunch of online services, like – Spotify, Google Music, SoundCloud, Bandcamp, Last.fm, YouTube and so many more. Tomahawk can also connect to other Tomahawk users’ libraries on the same network. But, that’s not all, Tomahawk also works as a social network for music lovers. You can browse you friends’ songs and listen to them, share and receive songs back and forth. 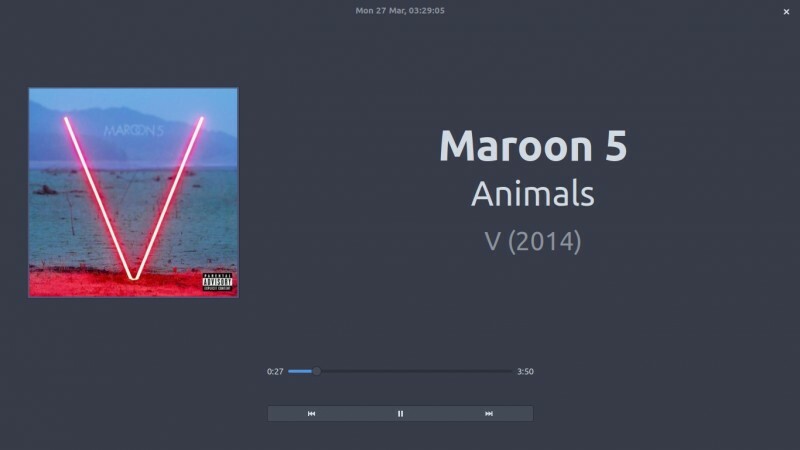 Yarock is one of the most lightweight music players on Linux. It was covered a while back on the Lightweight Alternative Applications for Ubuntu article. Yarock has a modern and elegant interface and provides various advanced features. Yarock contains smart playlist generator, ratings & play counts, gapless playback. Where Yarock is different from the others is that it supports multiple back-ends for playing audio. And you can also add multiple music collections. It has a minimal mode with a tiny interface. It also has support for desktop notification and command-line interface. Yarock can streaming radio services, like – TuneIn, SHOUTcast, Dirble etc. It supports music scrobbling to Last.fm. It can also fetch various information like artist bio, lyrics from the web. 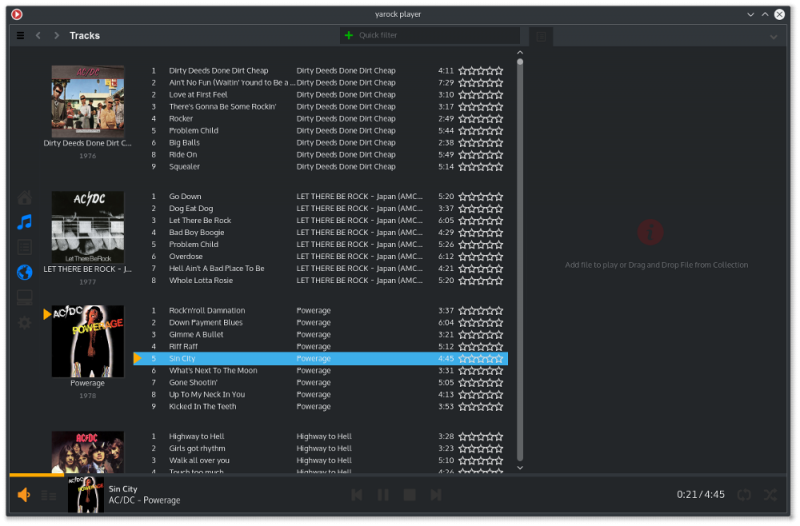 Sayonara is a small and fast music player for Linux. It has a unique and compact user interface. Sayonara supports external devices and dynamic playback. It has integrated metadata editor and mp3 converter. Sayonara supports cross-fading, speed and pitch control. It can show lyrics and album artworks as well. Sayonara can stream and record music from online services, like – SoundCloud & Soma.fm. It supports scrobbling to Last.fm and you can also broadcast radio right from Sayonara. 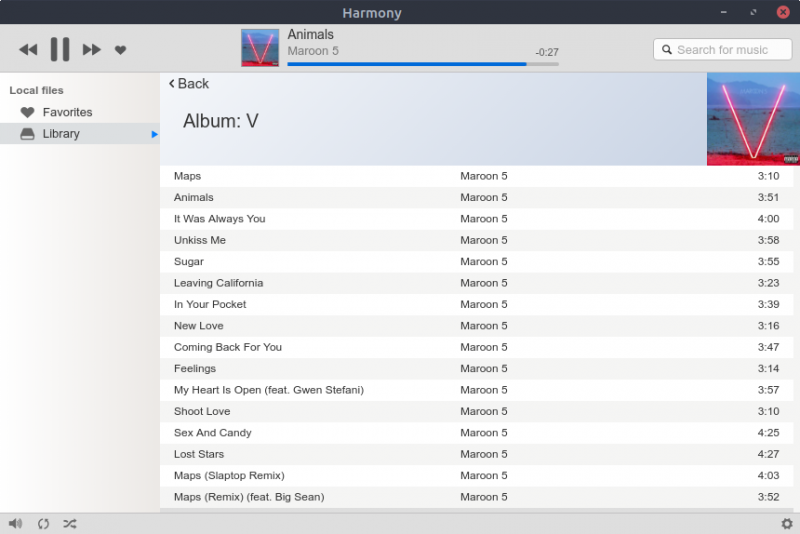 Harmony is a cross-platform music player built with Electron. Though it is neither open source nor free, but it is free-to-evaluate for an unlimited period of time and a nice option to look at. Harmony doesn’t have too many options to configure. It comes with a sleek user interface — with both light and dark theme. It’s responsive and has system tray integration. It also supports native scrobbling to Last.fm. It’s not only limited to local music collection. You can add online music services — like Google Music, SoundCloud, Spotify etc. — to Harmony. 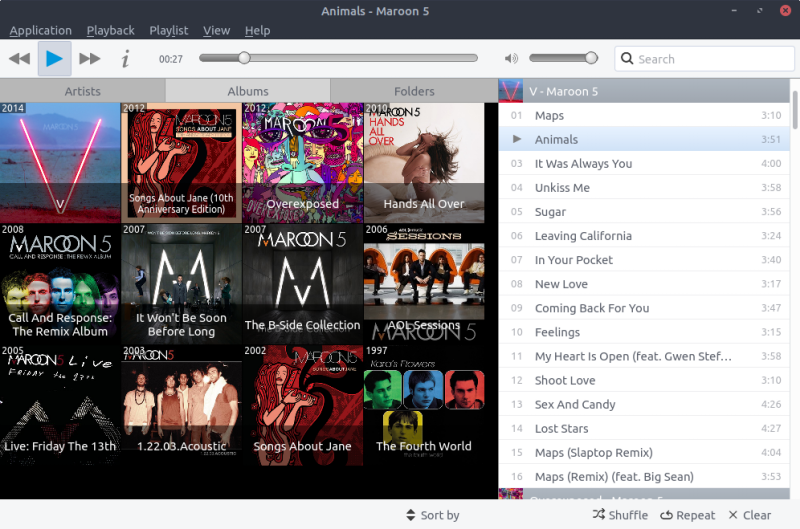 Musique is a lightweight music player, with an iTunes-like interface design. It is designed to be simple and left all the complex and advanced features outside. It can auto-correct misspellings & cases and fetch album artworks from the web automatically. You can also view information about the currently playing tracks, albums and artist. Musique supports scrobbling your songs to Last.fm. If you are feeling adventurous, there are a couple more options. Museeks and Babe! Both of them has nice and simple user interfaces. But these players are somewhat experimental and standard installer for them is not yet available. So, if you want to try them out, go their official site and seek out how to install them. Who knows, maybe you will end up liking one of them the most. Is there any other uncommon music players for Linux we might have missed? Let us know about those in the comment section! a bit iTunes looklike…for karaokes / large screens, e.g. thanks a lot for your list above.